In recent years, war and conflict within Europe’s geographical proximity has led to an increased number of people seeking refuge in Europe. In order to protect the free mobility within the Schengen area, judicial hinders such as the Carriers Liability, Schengen Visa Policy, the Dublin regulation and the EU Turkey Deal as well as border control have been reinforced, preventing safe passage for people seeking refuge. By closing off safe and legal routes, a far more treacherous journey is forced upon migrants wishing to reach safety in Europe. As a consequence, series of temporary spaces, legal and/or illegal, are being created and transformed. No Way is based upon interviews with people that have made the journey from the Middle East to Europe to seek refuge. 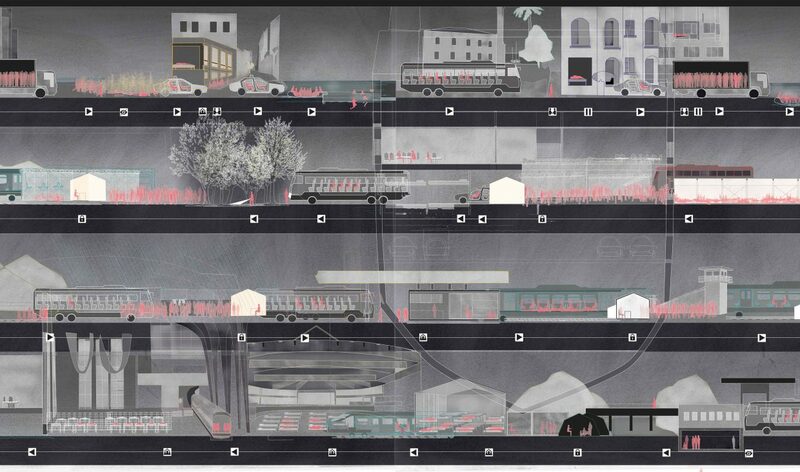 The project exposes the relationship between the formal and the informal routes, and how the spaces along these routes and the time spent in them affect the body and the mind. With the help of an architect’s tools and methods, using architecture as evidence, the aim of our work is to visualize, in two and three dimensions, the spatial, and in the end humanitarian effects of Europe’s migration politics. To take the discussion about these issues further CoRS arranged a panel talk with renowned participants specialised in law, architecture, criminology, sociology and storytelling. No Way has also been shown as interventions in the public space, as full scale drawings and an audio walk that enabled the visitors to listen to the informants’ stories and relate to different spatial situations along the way. Contrary to most architects’ wishes to build space, the ultimate goal of No Way is to eliminate spaces, more precisely the harmful spaces that people seeking refuge are exposed to. These spaces need to be replaced by a safe passage into and through Europe. In our strive towards this goal, we have involved asylum lawyer Viktor Banke and sociologist and criminologist Vanessa Barker in our work, adding their knowledge within law, criminology and sociology as a critical filter to our architectural findings. It is our belief that a cross disciplinary approach is necessary to create an understanding of this complex issue. We hope that this method of tackling the subject will shed new light on the consequences of closing the borders of Europe.